Fullname: Fernando Gabriel Tatis Jr.
Fernando Gabriel Tatis Jr...is the son of Fernando and Maria...his dad is a former 11-year MLB veteran infielder, widely known for hitting two grand slams in one inning...has three brothers, Joshua, Elijiah and Daniel, and one sister, Maria...Elijiah is currently in the White Sox organization...has a dog named Molly...favorite TV show is Friends ...originally signed by White Sox scout Miguel Peguero. Spent the entire campaign with San Antonio (AA), posting a .286/.355/.507 slash line with 16 HR and 43 RBI before undergoing season-ending surgery to repair a fractured left thumb in July...After slashing .177/.231/.333 with four doubles, three HR and 10 RBI in his 24 games played in April, he earned Texas League Player of the Month honors in May, posting a .336/.414/.639 line with 12 doubles, seven HR and 16 RBI...hit safely in 23 of his 29 May games, including 12 multi-hit efforts and six three-hit games...In his 35 games from 6/1-7/19, he slashed .319/.387/.511 with six doubles, six HR, 17 RBI and 31 runs scored...On 7/19, he fractured his left thumb sliding headfirst into second base on a steal attempt...he homered to lead off the game two at-bats earlier in SA's 7-4 win at Frisco...At the time of his season-ending injury, his 77 runs scored led the TL and ranked second across the entire minors...also ranked second in the TL in XBH (42), fourth in SLG (.507), tied for fifth in doubles (22), tied for sixth in hits (101) and tied for seventh in HR (16) and SB (16)...Earned TL Mid-Season and Post-Season All-Star honors and named an MiLB.com Organinzation All-Star for SD...Selected to the World Team roster representing the Dominican Republic for his first SiriusXM All-Star Futures Game appearance on 7/15 at Nationals Park...hit a 107.1 MPH single to left field on a 102.3 MPH fastball off CIN prospect RHP Hunter Greene in the top of the third...stole second base after his next at-bat with a Sprint Speed of 28.4 feet per second, per Statcast, above the Major League average of 27.0...Homered in back-to-back games for the third and fourth time in his career (5/1-2 and 6/30-7/2)...Recorded three multi-HR games (4/24, 5/15 and 6/30)...ended 2018 with four career two-HR games...Recorded a career-high-tying four hits and a season-high-tying three runs and three RBI in SA's 10-0 victory on 6/6 at Midland ...Hit safely in a season-high 13 consecutive games from 6/21-7/13 (.423/.464/.712), two shy of his career-high 15- game hit streak in 2017...Following the season, played for Estrellas Orientales in his hometown of San Pedro de Marcois in the Dominican Winter League... helped the club to their first championship in more than half a century, slashing .263/.379/.488 with three home HR in the regular season, followed by three more HR in the playoffs and earning MVP honors of the round-robin portion of the playoffs...Entered 2019 rated as the No. 1 overall prospect by ESPN.com and No. 2 by Baseball America and MLB Pipeline. Spent the majority of the season with Fort Wayne (A) and became the first 18-year-old in Midwest League history to post a 20-20 season (21 HR, 29 SB)...His 21 home runs set a Fort Wayne record and he led the Midwest League in walks (75) and on-base percentage (.390) while hitting .281 (121-for-431) and collecting 68 RBI and 29 steals in 117 games for the TinCaps...Earned Midwest League Mid-Season All-Star honors and was twice named Midwest League Player of the Week (5/15-21 and 6/26-7/2)...Named a Minor League and Low Class A All-Star by Baseball America and an Organizational All-Star for San Diego by MiLB.com...Recorded a career-high 15-game hitting streak from 5/4-20, hitting .410 (25-for-61) with five doubles, two triples, four home runs, 12 RBI and 13 runs scored over the stretch...Homered in back-to-back games for the first time in his career on 6/10-11 vs. Lansing...Stole a career-high three stolen bases on 7/9 vs. Lansing, recording five stolen bases in a three-game span...Three days later, recorded his first career multi-home run game on 7/12 at Burlington along with a career-high five RBI...Promoted to San Antonio (AA) on 8/21 and was the youngest player in the Texas League by season's end...finished the Missions' regular season on a nine-game hitting streak, batting .255 (14-for-55) overall in his 14 Texas League games...Received his first postseason action in the Texas League playoffs, starting in all five games and hitting .350 (7-for- 20) with a double, a home run, two RBI and five runs scored...Following the season, was drafted first overall in the Dominican Republic Winter League Draft by Estrellas Orientales where he started off hitting .400 (6-for-15) through his first five games before hitting .246 overall (14-for-57) in 17 games...Named the best power hitter by Baseball America following the season...Entered 2018 rated as the No. 3 prospect in baseball by ESPN.com, No. 8 by MLB.com and No. 9 by Baseball America. Made his professional debut with the AZL Padres (R) and hit .273 (48-for-176) in 43 games before also hitting .273 (12-for-44) in 12 games for Tri-City (A)...Recorded multi-hit efforts in 10 of his first 17 professional games from 6/22-7/13, hitting .342 (25-for-73)...Collected just five multi-hit efforts in his next 26 games from 7/14-8/18, hitting .223 (23-for-103)...Assigned to Tri-City on 8/19 and hit safely in eight of his 12 games. 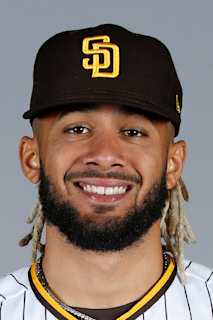 January 24, 2019 San Diego Padres invited non-roster SS Fernando Tatis Jr. to spring training. July 21, 2018 Fernando Tatis Jr. roster status changed by San Antonio Missions. July 17, 2018 San Antonio Missions activated SS Fernando Tatis Jr. from the temporarily inactive list. July 14, 2018 San Antonio Missions placed SS Fernando Tatis Jr. on the temporarily inactive list. January 18, 2018 San Diego Padres invited non-roster SS Fernando Tatis Jr. to spring training. October 14, 2017 SS Fernando Tatis Jr. assigned to Estrellas Orientales. August 21, 2017 SS Fernando Tatis Jr. assigned to San Antonio Missions from Fort Wayne TinCaps. April 2, 2017 SS Fernando Tatis Jr. assigned to Fort Wayne TinCaps. March 1, 2017 SS Fernando Tatis Jr. assigned to San Diego Padres. August 19, 2016 SS Fernando Tatis Jr. assigned to Tri-City Dust Devils from AZL Padres. June 20, 2016 3B Fernando Tatis Jr. assigned to AZL Padres. June 4, 2016 San Diego Padres traded RHP James Shields and cash to Chicago White Sox for Erik Johnson and 3B Fernando Tatis Jr..
July 2, 2015 Chicago White Sox signed free agent 3B Fernando Tatis Jr. to a minor league contract.